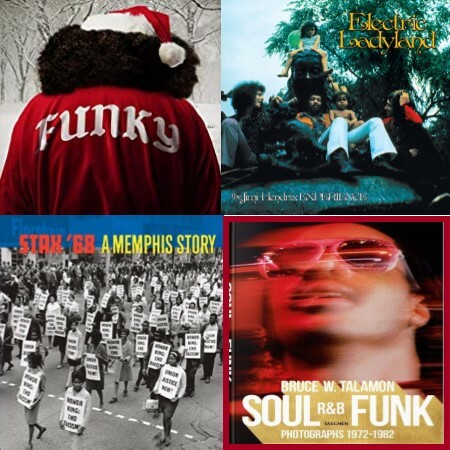 Welcome to the December 2018 Holiday Edition of Black Grooves, sponsored by the Indiana University Archives of African American Music and Culture. In keeping with the season, we’re starting off with our list of the Best New Holiday Albums, featuring releases from PJ Morton, Cece Winans, John Legend, Aloe Blacc, After 7, and Motown Gospel artists. Special editions and box sets include Stax ’68: A Memphis Story (5 CDs), The Jimi Hendrix Experience’ Electric Ladyland 50th Anniversary Deluxe Reissue (2 CDs + Bluray), John Tefteller’s 2019 Classic Blues Artwork from the 1920’s, vol. 16 (calendar + CD), Voices of Mississippi: Artists and Musicians Documented by William Ferris (3 CDs + DVD) and companion DVD The Early Films. Other sets reviewed in brief include The Chic Organization 1977-1979 (5 CDs), The Staple Singers’ For What It’s Worth, Complete Epic Recordings 1964-1968 (3 CDs), Art Ensemble of Chicago/Associated Ensembles (21 CDs), Complete Cuban Jam Sessions (5 CDs), and Al Green’s The Hi Records Singles Collection (3 CDs). For the vinyl lover on your list, there’s Eccentric Soul: The Saru Label (2 LPs), gospel singer Theotis Taylor’s long lost debut album Something Within Me, the first ever reissue of It’s Nation Time – African Visionary Music on Motown’s Black Forum imprint, plus Maxwell’s Embrya 20th Anniversary Edition, and Jermaine Dupree Presents So So Def 25. Other new releases include The Garner Poems from Ohio group Mourning [A] Blkstar, Broken Politics from the eclectic Neneh Cherry, and two jazz albums— Flight by James Francies, and Lebroba from the trio Andrew Cyrille/Wadada Leo Smith/Bill Frisell. If you’re looking for books to gift, we’re featuring three volumes of photography—Bruce W. Talamon’s Soul R&B Funk Photographs 1972-1982, Vikki Tobak’s Contact High: A Visual History of Hip-Hop, and Meredith Ochs’ Aretha: The Queen of Soul―A Life in Photographs. Or, if you prefer an inspirational autobiography, Tina Turner’s My Love Story. Wrapping up this issue is our list of November 2018 Black Music Releases of Note.